Picture, for a moment, a beautiful sunset on a tropical island, as a tree spreads its arms to the sky and drops its sticky fruits to the earth. Imagine a seabird soaring through the sky, chirping into the breeze, when it notices an array of insects trying to feed on the delicious fruits at the foot of the tree. "Free breakfast!" the bird crows, as it swoops down, attempts to eat the insects … and finds out that it's in a horror movie. Oops. It turns out that the sap from the fruit is so sticky that the bird is permanently glued to the roots, where it either dies from starvation or is ripped to pieces by other predators. In the end, any bird parts that remain get absorbed as nutrients by this villainous tree. Some birds don't even make it to the ground, getting stuck in the branches and becoming creepy bird mummies. Nightmare fuel much? Yikes. These monster plants are called Pisonia trees, or alternatively, "birdcatcher trees." They're found in tropical locations around the Pacific and Indian oceans, and according to Curiosity, the roots and branches of a Pisonia tree are littered with enough petrified bird corpses to make slashers like Jason Voorhees jealous. Perhaps the creepiest thing about all this is that for whatever reason, birds — and seabirds in particular — absolutely adore these demon trees. 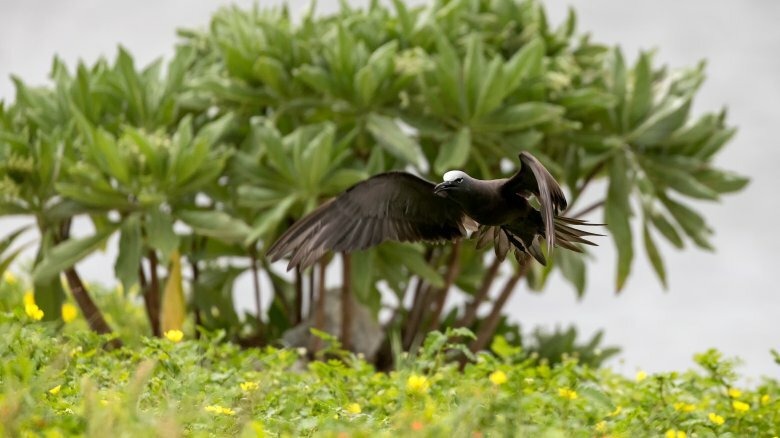 According to wildlife biologist Beth Flint, Pisonia trees are almost always covered with live seabirds who haven't yet fallen prey to the plant's carnage. Some birds, such as white terns, even play with fire by laying eggs in the holes created when the tree's branches break off. Pisonia groves are so beloved by black noddies, red-footed boobies, and other birds that Flint's job actually involves promoting the growth of more Pisonia, thereby allowing the tree to strengthen its hold as the avian world's benevolent dictator. If the relationship between Pisonias and birds went on Facebook, though, it would definitely fit into the "It's complicated" category. As a group, the American Bird Conservancy says seabirds are among the most endangered birds in the world. This is often due to factors such as poaching and exposed fishing lines, but the Pisonia gorefest probably doesn't help matters, as the BBC says Pisonias trap hundreds of thousands of seabirds a year. On islands such as Cousine in the Seychelles, conservation officers are tasked with finding Pisonia-trapped birds, un-sticking them, and cleaning the seeds away. Nonetheless, the birds keep coming back twice a year, every year. Pisonias flower and fruit at precisely the same time that seabirds migrate to them and lay their eggs in the branches, potentially dooming their offspring. Pisonia is the illicit drug of the seabird world: bad for you, but once you get hooked, totally irresistible. Pisonia trees are yet another crazy example of how mysterious the natural world is, and how much humans still have to learn. It's easy to think that opposable-thumbed primates are the top dog of Earth's ecosystem, but what if trees are the true masters? What if they're simply biding their time and pumping people full of oxygen until they drop dead, so they can decompose into plant food? Yeah, good luck sleeping tonight.